Lots of spooky raqs fun to be had in metro Atlanta this October!!! World Belly Dance Alliance and Amani Jabril Middle Eastern and World Dance will present a special preview of featured choreographies to be included in the April 12, 2014 stage production of “Juice Box." More details here. A performing and visual arts event featuring performances by Kira Lang and Balefire. RSVP to the Facebook event for details. Halloween Hafla at 7:00 p.m.
Evadne Medina presents a Bollywood workshop with Jaki Hawthorne of Jahara Phoenix, followed by a Halloween hafla. Come in costume! RSVP to the Facebook event for details. Awalim Dance Company apprentices, students, and friends will be performing in the Oakhurst Festival parade (and most likely some impromptu street performances) with Balkan brass band Black Sheep Ensemble. An evening of dance with Samora, along with members of her troupe, Amoraat, as well as students, friends, and special guests -- plus Nicola! Tickets are $23 and include a Lebanese dinner. Tickets for Samora's current students, children under 12, and senior citizens 60+ are $18. Get advance tickets here. One of Atlanta's favorite fall events returns, featuring Awalim Dance Company with live music and the unique Tribal variation some call "parade ATS." Don't miss all the costumes, fun, and food! Click here for more event info. 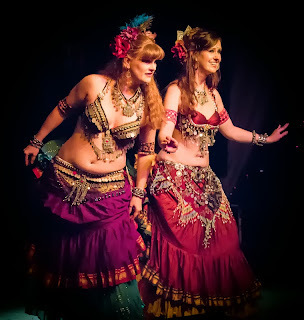 The legendary Tempest will be in town and is offering a workshop at Atlanta Fusion Belly Dance. In this class, Tempest will teach sassy combinations that capture the elegant form, fluid movement, and dramatic stylings of the early 20th century. Click here to register! RSVP to the Facebook event for all the latest details. Join teachers, troupe members, and students for the studio's twice-yearly showcase. Check the Atlanta Belly Dance web site for ticket sales and more details. Get your geek on at the Halloween Oasis! Join Mina, Mariana, friends, and special guests for an evening of performances inspired by fantasy, science fiction, and gaming! Visit the Facebook event for more info. Athens' Qamar Tribal Odyssey Belly Dance will perform at the Lickskillet Artists' Market, an indoor/outdoor festival featuring art, music, kids' activities, food trucks, and more. Come out and see Tribal Odyssey group improv, as well as group and solo choreography... plus live drumming! Classic City belly dancers congregate for the fifth consecutive year for the Wild Rumpus, produced by the legendary 40 Watt Club. Parade participants are to line up in costume at Clayton & Pulaski Streets at 7:00 p.m.
After a three-year hiatus, the Awalim Dance Company's Halloween show is back by popular demand! This year's extravaganza will feature silly and spooky performances by Awalim's company members and Banat Almeh troupe members... plus special guests including Inara, Rafi'a Dance Company, Jenny Nichols, Halleya, Lacy Perry and Oleandra, Northside Tribe, and more! Click here to learn more and get your tickets. Check out the Facebook event for all the latest updates.